Gold was a little choppy overnight in a range of $1341.25 - $1348.65. It traded up during early during Asian hours in response to the American, British and French retaliatory air strikes against Syria, taking out some light resistance at Friday’s $1347 high to reach $1348.65. However, the advance was limited, and failed to lift gold past options resistance at $1350 as the strikes were largely expected and didn’t seem to further escalate the situation. The yellow metal dipped to its $1341.25 low during early European time as the US dollar rose (DX to 89.83), helped by a weaker than expected reading on German Wholesale Prices that softened the euro ($1.2342 - $1.2324) and some hawkish comments by the usually dovish Kashkari. He said that recent steps by the federal government to stimulate economic growth including tax cuts made reaching a 2% inflation objective more likely, and means the Fed can most likely move ahead with additional planned interest-rate hikes this year. Later during European hours, the DX retreated to 89.51, hurt by gains in sterling ($1.4237 - $1.4320) and the euro ($1.2373), and boosted gold back to the $1345 area ahead of the NY open. Mostly firmer global equities were a headwind for gold with the NIKKEI up 0.3%, the SCI off 1.5%, Eurozone shares ranged from -0.4% to +0.2%, and S&P futures were +0.6%. A dip in oil (WTI $67.16 - $66.12, fears of escalating tensions on Syria waned, Baker-Hughes rig count +7 to 815 – highest since 3/2015) weighed on equities. At 8:30 AM, a stronger than expected reading on US Retail Sales helped drive US stock futures higher (S&P futures +20 to 2678), and brought the US 10-year bond yield up to 2.865% (3-week high). 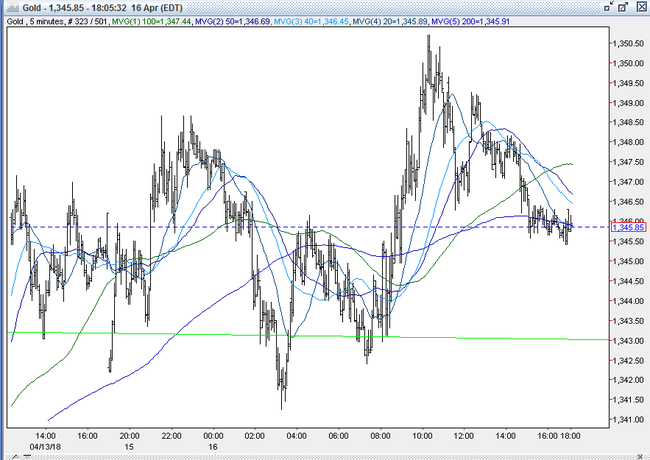 The DX ticked up to 89.61, and pushed gold back to $1343. However, the dollar strength was short-lived, as the DX quickly slipped back below 89.50 from continued strength in the euro ($1.2394) and the pound ($1.4330), which allowed gold to bounce to the overnight high at $1348. Later in the morning, US stocks pared gains on their open (S&P +10 to 2666), and the 10-year yield slipped back to 2.841%, hurt by a miss on the NAHB Housing Market Index (69 vs. exp. 70). The DX slid down to 89.39, and gold pushed higher. Gold was able to breach resistance at $1350 to make its high of $1350.70. Into the afternoon, US stocks turned higher (S&P + 28 to 2687), with Merck, utilities and energy leading gainers. The US 10-year yield ticked up to 2.852%, and the DX clawed back to 89.55. Gold retreated, by found support at $1346. Later in the afternoon, US equities came off slightly from their highs (S&P finished +12 to 2678), and the 10-year yield dipped to 2.825%. The DX drifted lower, and remained steady between 89.41-89.47. 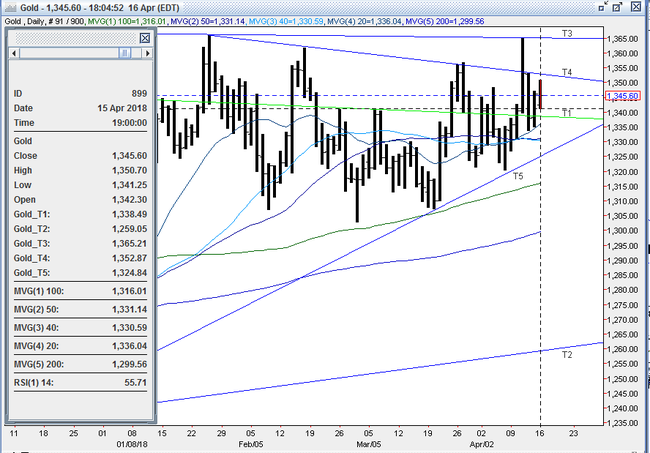 Gold failed to benefit, however, and hovered between $1345–46. It was $1346 bid at 4PM – unchanged. Open interest was off 7.6k contracts, showing a net of short covering from Friday’s decline. Volume was much lower with 280k contracts trading. The CFTC’s Commitment of Traders Report as of 4/10 showed the large funds paring 0.2k contracts of longs and adding 11k contracts of shorts to reduce their net long position to 155k contracts. In the last three sessions, another approximately 10k of net longs were added - mostly on the rally to $1365. While the paring of the net fund long position is not good for sentiment, it certainly sets up the market better to move higher, as it leaves plenty of room for sidelined longs to come in, and the addition of new shorts can fuel a rally if / when they are forced to cover. Bulls feel that gold is building a base, having made higher lows 5 of the last 6 sessions since 4/6. With the favorable large fund positioning (mentioned above), several geopolitical hotspots, and a strong belief that the direction in the dollar is still south, bulls feel gold is poised and positioned to move considerably higher. Bulls look for a breakout over resistance at $1353 (4/12 high, down trendline from 1/25/18 $1366 high) and $1365 (down trendline from 7/6/16 $1375 high, 6 tops – 4/11, 1/25, 8/2/16, 8/3/16, 8/4/16, and 8/5/16 highs) to challenge the 7/6/16 high at $1375. Bears remain comfortable selling into strength, and buying back the subsequent dips. They believe that gold has no follow through to propel it past the $1360’s, as they have witnessed a gold rally graveyard on forays north of $1340 for months. They still believe a major bottom in the DX from 2 months ago is in place at 88.25, and expect its rebound to resume. The bears will look for a breach of support at in the mid-low $1330’s to challenge support at $1325 – the up trendline from the 12/12/17 $1236 low. All markets will continue to focus on the volatility in the equity and bond markets, geopolitical events, developments with the Trump Administration, corporate earnings, oil prices, and will turn to reports tomorrow on Chinese GDP, Retail Sales, and Industrial Production, Japanese Industrial Production, German ZEW, Eurozone ZEW, US Housing Starts, Building Permits, Industrial Production, Capacity Utilization, and comments from the Fed’s Quarles, Harker, Evans, and Williams for near-term direction.